I’m On a Boat! – Dreadfleet Docks! The Games Workshop Mystery Box is unveiled! Avast me Maties, DreadFleet is dead ahead! 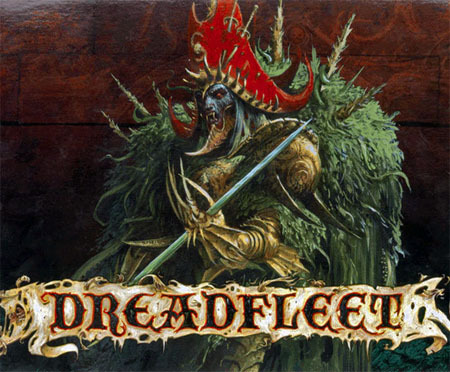 Dreadfleet is a boxed game for two (or more) players that includes everything you need to make war on the turbulent seas of the Warhammer world. At your command are two fleets of ships – the Dreadfleet led by the Vampire Count Noctilus, aboard his gargantuan sea-hulk the Bloody Reaver; and the Grand Alliance commanded by the Pirate Captain Jaego Roth, who recently stole the Heldenhammer – the pride of the Imperial Fleet, and one of the largest galleons to ever sail the high seas. Price: $115This looks to be a splash release in limited numbers, a la Space Hulk, but without miniatues that are of the same scale as existing Games Workshop mainline gamesystems. Its official ship date is October 1st. Follow along in the BoLS Lounge Here (scross down for pics). Its got ships, islands, cards, a big rulebook. Also its officially International Talk Like a Pirate Day on Monday the 19th, but we’re startin early you scalliwags! Get to it or we’ll keelhaul the lot of ya!